One popular method of working on your balance is called a "circle of life" or a "wheel of life." Usually these circles will consist of eight (or so) slices of your life. These slices are categories from your life; which can be used for improvement. They are often some form or fashion of these: family, friends, spirituality, finances, self esteem, fitness, nutrition, stress mastery, hobbies, relationships, life purpose, and so on. Each person's categories (regardless of whether they are six, eight, ten, or some other arbitrary number) are different. I chose the eight most significant parts of my life: spirituality, family, finances, health, work, friends, hobbies, and community. Once you have your pie designed, sliced, and labeled, then you rate each category on a scale of one to ten, with ten being absolute perfection (level ten is practically impossible to achieve, but a great goal area to keep you improving toward). Using this scale, you dissect each slice by drawing a line representative of this rating. This new line will literally shrink each piece of pie, based on how good you are doing in that aspect of your life. 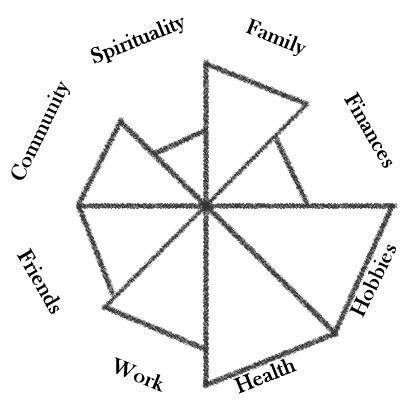 I currently rate my pieces like this: family=7, finances=4, hobbies=8, health=8, work=7, friends=6, community=6, and spirituality=3. As you can easily see, this is not close to being a perfectly round circle. 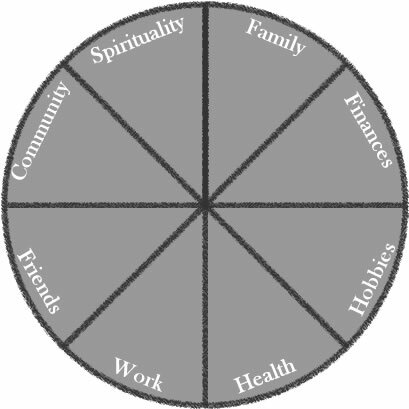 Many of the motivational speakers ask you to visualize this completed circle of life as a wheel on your car. Now imagine trying to drive along with a wheel that is shaped like this. As you can see, you would have a bumpy ride to say the least! This translates to your life ... Without balance, your life will be a bumpy ride. To simplify this drawing, I created a scale (that was derived from my own ideas mixed with those of countless self-improvement coaches, family, and friends) that I follow with the most important aspects of my life. I rate each of these eight parts individually with a number from one to ten, where one is horrible, and ten is the absolute best. I add all of my category ratings together and then divide by the number of categories to give me a balance "average." I call this my life balance value. These all add together to equal 49. From there, I divide by the number of categories; which in my case is eight. I round down and find that my life balance average is 6. So, my overall “life balance value” is only a six. I consider an average of eight to be an exceptional life and that is where my goal is set. So, I need to work on each thing to get them to create an average of eight. It is my belief that each of these pieces should be at least equal to six (above average) in order to achieve true success. And, my overall score should be eight in order to lead an exceptional life. Now that I have that life balance value, I use Dr. W. Edwards Deming’s cycle of improvement to work on each of these areas (categories). Simply put, his cycle is: Plan, Do, Check, and Act. In this way, I can continually improve any part of my life by simply repeating this cycle in a never-ending pattern. I am working on it, but it is a tough thing to improve one's quality of life. What is your life balance value?